Julia Lohmann and Gero Grundmann held the workshop 14 Local Links with European Design Labs students. The workshop was intended to put students in contact with local craftsmen so that they may research their work processes, document them and share these experiences. An archive of materials, techniques and processes emerge from these contact, which will serve as the basis for develoing each personal project. The activities began with specialized workshops for different materials: wood, metal, upholstery, binding, ceramics, plastics, silk-screen printing… situated in the outskirts of Madrid. 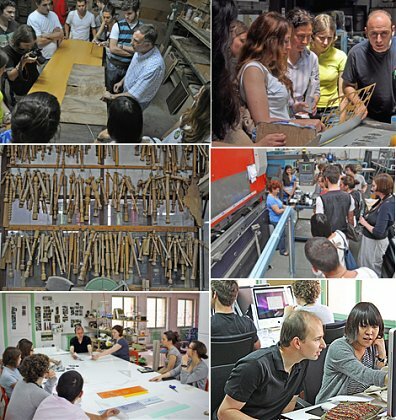 As well, students visited other specialized craftwork establishments: a chocolate factory, a luthiers workshop, a restoration workshop, a workshop speciailzed in hand fans… After their visits, students prepared their project briefings, following personalized template provided by the designers. The objective was to transfer an optimal work methodology to the students, allowing them to create coherent, effective and attractive projects. From this information, each participant must develop their own design: product, service, communication element, campaign, installation or work of art, imagined in terms of the workshop visits, offering new ideas for the development of each craft or company, as well as new creative possibilities that will benefit the local market.